1984 Topps Indiana Jones and the Temple of Doom is the second of five sets the company has made for the blockbuster film franchise. Although it has a little more to it than 1981 Topps Raiders of the Lost Ark, it's still a very standard set for the time. 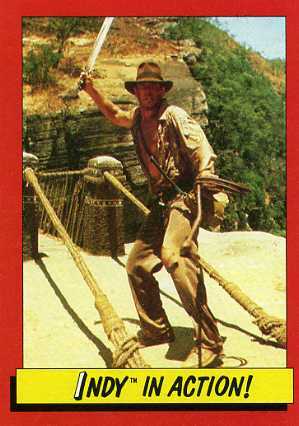 The 1984 Topps Indiana Jones and the Temple of Doom base set has 88 cards. All work to retell the story of the film, capturing key scenes and events. Sadly, (spoiler alert) there is only an allusion to monkey brains. And (another spoiler alert) no raft flying from the sky, but that's probably a welcome exclusion for most. Cards have thick red borders. Combined with the bright yellow bar at the bottom of the card that holds the caption and you've got something that feels a little bit like pop art or more comic bookish than the film actually is. Card backs are much better. Actually, they're some of the best Topps has done for a film. The title art is at the top of the card. To one side is an illustration of Indy, machete and whip in hand. A light yellow box contains the card's writeup. The 11 stickers are plain to a fault. Focusing mainly on characters, they are die-cut like most Topps stickers from the time. However, there's no thick border. Couple that with the plain background and you've got a boring looking, at least as a card. Stuck to a notebook or locker door, this wouldn't be noticeable. Many of the stickers also have a comic-looking speech bubble with short quotes. Sticker backs form a puzzle of Indiana Jones. Complete sets with cards and stickers can usually be found for less than $25. And while there's no major shortage of supply, it's also a set that doesn't appear to be quite as plentiful as other sets from the era. 1984 INDIANA JONES TEMPLE of DOOM UNOPENED BOX OF 36 PACKS BEAUTY!! 16 To the Palace of Pankot! 29 Look Out, Behind You! 34 Indy Gets the Point! 48 Short Round to the Rescue! 61 Indy's Fight For Life! 65 The Kids Slug it Out! 66 Indy on the Scene! 72 Hang on, Short Round! 73 Saved by Willie Scott! 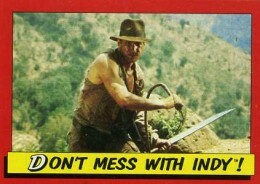 75 Don't Mess With Indy! 76 Two Against One...& No Gun! 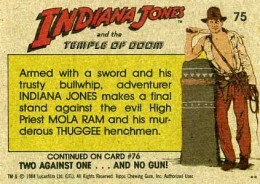 84 Indiana Jones vs. Mola Ram! 85 A Day of Rejoicing! 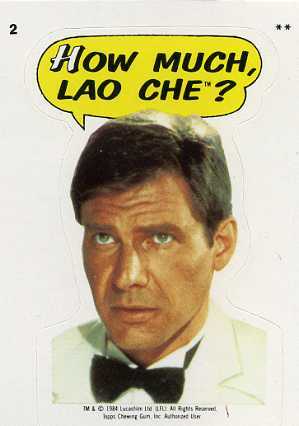 2 How Much, Lao Che? 3 The Goddess Kali Reigns! 10 You've Had it, Mola Ram! however, I can’t find any pictures of this serie on the internet. Do you know if Topps ever produced IJLC cards back in 1989 ?